Healthy Glow was made to give you the healthy, natural dose of color you want, but with the SPF protection you need. All skin types in need of a healthy glow! A moisturizing sunless tan, that protects while delivering natural-looking, buildable, long-lasting color that's streak-free, transfer-free and scent-free. Application is made easy with light spray that instantly disappears into skin with a healthy, natural glow developing in just two to four hours. Prepare skin by cleansing then by exfoliation using a loofah; this will avoid uneven application of color. 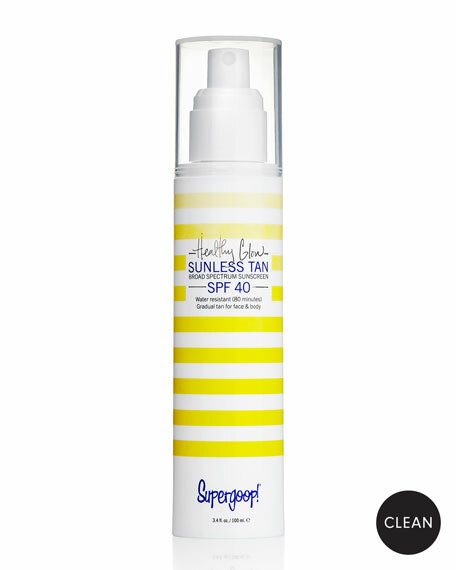 Spray directly on your body and blend with your hands using a circular motion, making sure to evenly coat all areas. For face application, first spray onto the palm of your hands. Wash hands immediately after application to avoid tanned palms. To avoid staining of clothes, wait until touch dry before getting dressed. Don't shave, bathe, or swim for at least an hour after applying the product. Allow two to four hours for color to develop. Reapply regularly to maintain color.